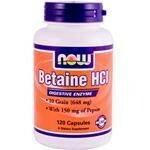 Betaine HCL supplements are used to supplement the body's own production of stomach acid in conditions where hypochlorhydria (low stomach acid) or achlorhydria (absence of stomach acid) are present. These conditions lead to poor protein digestion as stomach acid itself is required to start the breakdown of protein and it also activates the protein-digesting enzyme pepsin. Stomach acid deficiency may be an underlying cause of irritable bowel syndrome (IBS) and food allergy/intolerance as partially digested proteins irritate the intestinal mucosa and trigger immune reactions. Another consequence can be increased numbers of bacteria in the upper gastrointestinal tract - a condition known as small intestinal bacterial overgrowth (SIBO); acid from the stomach usually keeps bacterial numbers down as they can't survive in a highly acid environment. The same can be said of yeasts such as Candida albicans. For the same reason a stomach acid deficiency can also increase the risk for food poisoning. For all the reasons above deficient stomach acid production can result in nutritional deficiences, not just of protein but of micronutrients such as vitamins and minerals due to damage to the intestinal mucosa impairing absorption and/or because increased numbers of bacteria use up the nutrients themselves. One particularly important nutritional deficiency that is likely to result from lack of stomach acid is that of vitamin B12. This is because stomach acid, as well as activating pepsin, is also required to activate intrinsic factor which is essential for the absorption of vitamin B12. Finally, although gastroesophageal reflux disease (GERD) is most commonly associated with having too much stomach acid, it can also result from hypochlorhydria and achlorhydria. Betaine HCL supplements may therefore be helpful for those diagnosed with hypochlorhydria, achlorhydria, and various other digestive disorders where signs of poor digestion are present including IBS, SIBO, and food allergies/intolerances, as well as certain cases of GERD.